UNSUNG heroes from around Downend and Staple Hill were among the winners at a special community awards ceremony recognising their voluntary work. Community stalwarts Reg Bennett, Angie Boyle, Pat Ross, David James, Julie Aldrich, Nan Cuckow and Lin Stoneman were among the winners of South Gloucestershire Council’s Chair’s Community Awards. 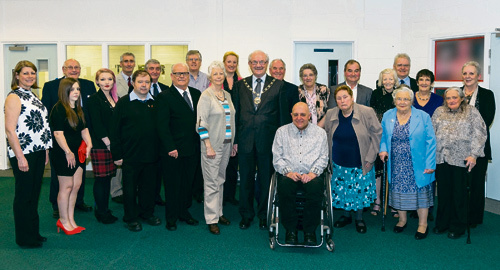 The annual awards recognise the outstanding contribution South Gloucestershire residents make to their local communities and acknowledge people who give up their time freely to help others and bring communities together. • Reg Bennett has worked tirelessly for the community for many years in a number of roles including vice chair of his neighbourhood watch group, setting up a Speedwatch and most recently leading Save Cossham Group. • Angie Boyle works maintaining the plants and flowerbeds in the Sensory Garden in Page Park. Many single elderly people visit the garden when they know Angie will be there so they can enjoy a good chat. • Pat Ross also works in the park, spending several hours a week maintaining the Sensory Garden. She plants, dead heads and weeds making sure the garden looks beautiful. Many visitors enjoy Pat’s company and she is a well-known face in the park. • David James makes a huge contribution to voluntary work in Staple Hill as a Salvation Army Officer. He is well aware of the needs in the area, takes part in projects and keeps other volunteers informed. He is efficient and a trusted Secretary of the Staple Hill Regeneration Partnership and also well-known through his monthly visits in the Priority Neighbourhood. There were also three awards for volunteers at the Stroke Café, held once a month at Badminton Road Methodist Church in Downend. • Julie Aldrich volunteers at the café and ensures the group runs smoothly. She sets up the room, serves refreshments and clears away afterwards. When there are any trips, Julie organises the finer details like transport requirements and never says ‘no’ to any requests for her time. • Also recognised for her work at the café is Nan Cuckow. She is part of a team that discusses activities, speakers and puts forward ideas. The group is a lifeline for several attendees and without Nan’s dedication the Stroke Café would not run. • Lin Stoneman has worked at the café since 2009. She is the eyes and ears of the group and always makes sure that those that need a little extra help and attention receive it. When required, Lin will also be a taxi for the group. For stroke survivors and their carers Lin has made a big difference in their lives. The award ceremony took place at South Gloucestershire and Stroud College’s WISE Campus on Thursday March 12. Chair of South Gloucestershire Council, Cllr Howard Gawler, attended along with the Lord Lieutenant of Gloucestershire Dame Janet Trotter and Vice Lord Lieutenant Robert Bernays, principal and chief executive of South Gloucestershire & Stroud College Kevin Hamblin and vice principal Sara-Jane Watkins. Cllr Gawler said: “One of the highlights of my term of office as Chair of the Council has been meeting people from across our region who selflessly give up their time, with no financial reward, for the good of their communities.